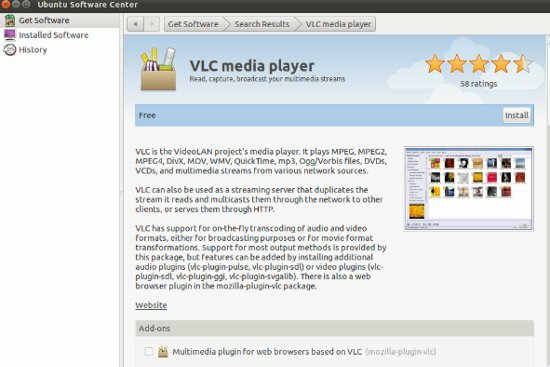 There are lot of Music players available for Ubuntu 11.04 (Natty Narwhal) but VLC is the most popular media player, not only for Ubuntu 11.04 or Linux Distros but also on Windows (7, Xp or Vsita) and Mac OS X. VLC is a free and open source multimedia player. it’s available for all common platforms. it has been developed/maintained under VideoLAN project. VLC is known as all in one media player, because it can play all the common media file formats – like mp3,avi,flv etc. Actually VLC is capable of handling a lot of input and output file formats. Ubuntu 11.04 has banshee media player as a default media player, which is a nice one but not suitable for all cases. VLC can be installed in multiple ways – e.g from Command Line, Ubuntu Software Center or from Synaptic Package Manager. Here we will cover any two methods. After installing you may need to install some proprietary libraries and codecs e.g libdvdcss2 for playing music/movies DVD (Encrypted using CSS (Content Scramble System) encryption algorithm). In Ubuntu software center , vlc got 4.5 start, through the 50+ ratings. Now, you can check the popularity of the application before installing, in the Ubuntu Software center, through reviews/comments and ratings. #1 : Open Ubuntu Software Center (go to menu located at Top Left corner and search for ‘ubuntu software center’ ). #2 : search for ‘vlc’ and click on install button to proceed. #3 : Wait for the installation to complete. Open the terminal (CTRL+ALT+T) and type the commands , followed by your ubuntu login password. I have the exact same problem…did you find a solution? it says – reading package lists… error!E: encountered a section with no package: headerE: problem with Merge list /var//lib/apt/lists/us.archive.ubuntu.com_ubuntu_dists_natty_main_binary-i386_packagesE: the package lists or status file could not be parsed or opened. I am new user to ubuntu.. please help me. E: Encountered a section with no Package: heReading package lists… Error! Hey.. I don’t have internet connect and I want to install vlc in ubuntu 11.04. Please help me and let me know how I would be able to do this. I have also ready your topic regarding how to install vlc in ubuntu 10.04, I have notice that someone had asked the same question and you have given a website to him for downloadign the same. I too have checked that website but that website is not working and not allowing serch and downloading any package. i m not able to install vlc bcoz of following problem pls suggest me wat to do……..